If you have been interested in using marble as your kitchen countertop, as tiles for your floor or for whatever purpose and have read a little about it, you must have probably noticed that the word sealing comes up each time. That is so because marble being a porous stone requires some degree of protection from dirt, as it will be a total waste to have the beauty of such as stone tampered with because of a wine or oil stain. That being said, what is the process of sealing? It is simply the application of surface treatment on porous stones (not only marble) to retard corrosion and staining. 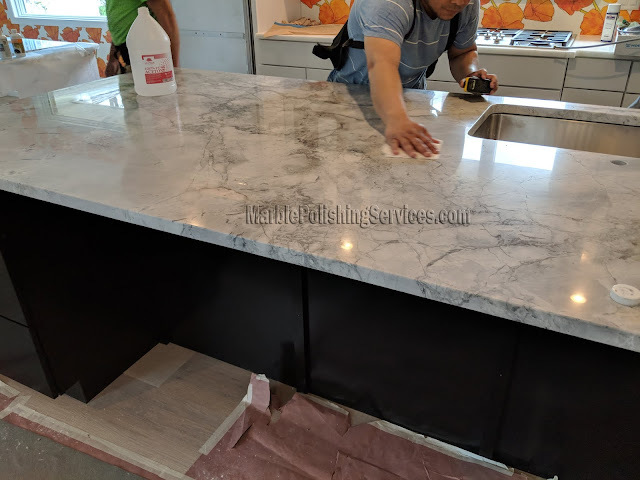 Relative to the sealing of marble, a few questions come up often and we are going to provide answers that will make you able of taking good care of your marble countertop and maintain its natural elegance and beauty for as long as possible. 1 – Does Polished Marble Need Sealing? Even if marble needs to be sealed with a penetrating sealer to avoid stains settling in, given that once the stains are in, they are practically impossible to get out. 2 – Do Marble Tiles Need Sealing? Marble tiles definitely need sealing, and the sealing needs to be done immediately after installation. Note that, sealing is particularly important on marble tiles, as being on the floor makes them very much exposed to dirt therefore increasing the chances of it penetrating and permanently staining your tiles. So, as with marble in general, the sealing should be done at installation and frequently after so it can maintain its beauty and glow. 3 – Can Marble be sealed after Grouting? Grouting at some point may be necessary in the maintenance process of marble. Can you then seal marble after grouting? Yes, you can and probably should because sanded grout can scratch the surface of your tiles. However, note that you can only seal your marble after the grout would have dried for 24 hours. 4 – How Do You Remove Etching from Marble Countertops? Etching tends to seriously compromise the visual appearance of your marble countertop. Thankfully, every problem has a solution and that of etching is polishing. Most of the time, etching can be removed by polishing. However, the polishing should be done by a professional only for best results. We hope we were able to clarify your doubts about the sealing of marble. We therefore conclude saying that marble can be very durable and can easily maintain its beauty if sealed correctly and at the right frequency. Do not hesitate to contact professionals if you need sealing done properly as it ought to.